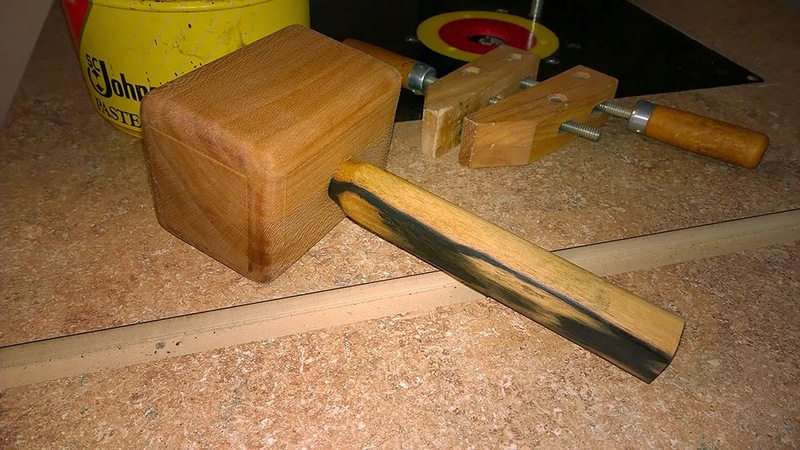 A small mallet for the shop. The head is about 6" long, to give you some perspective. (Sorry, I was out of bananas for scale...) The head is sycamore, and the handle is black & white ebony. Both were in my "turning bits" box, all waxed up and waiting to be made into something. The sycamore was racked. Nothing like a square or rectangular shape. I "jointed" it on the bandsaw to get it squared. (I really should document this technique. It's so fast and useful for small parts.) Drilled it through with a 11/16" bit, used a roundover bit on the router, then set it aside. The handle was more of a challenge. I used the roundover bit to get it started, but there was lots of shaping to get it to fit in the hole I drilled. I started out with sandpaper, but aside from being REALLY tiresome, it was spreading the black from the ebony into the white. You can still see some in the pores of the white portions. Then I remembered a cheap Harbor Freight block plane I had bought for my daughter to use. I had sharpened it up when I got it, then set it aside and neither of use had ever used it. I figured it was worth a shot. Simple and cheap, but with a sharp iron it works great. Took some fiddling to get it to cut down into the wood like I needed, but it worked great. 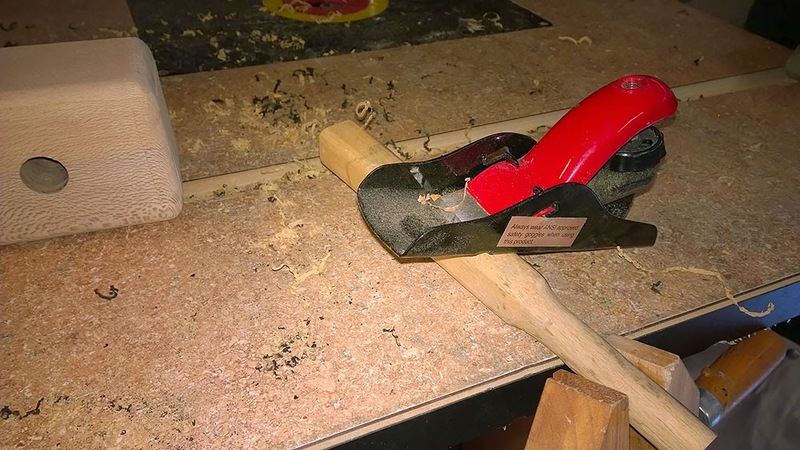 A plane is a fairly simple device, a block plane even more so. I know we can complicate them, but really all a plane does is provide a handle for a blade held at a specific angle. The foot is smoothed and waxed, the iron sharp, and that's all I needed. After wedging the end of the handle, I applied a wax finish. Normally I would oil it too, but I couldn't find either my can of BLO or my can of mineral oil. So wax it is.